Craft a Scene: Last day to enter Beach challenge! Last day to enter Beach challenge! Today is the last day to enter the Beach - "a bit of sand and water" challenge. I have another email entry and this time it is from Margaret. 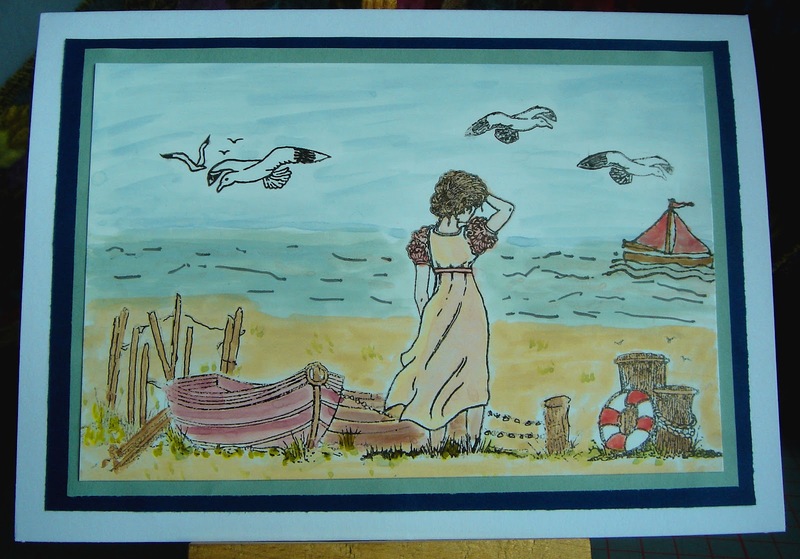 "Margaret from Yorkshire here again with another card, This time for the Beach Scene challenge. The stamps I used for this one were from Butterfly Kisses. I used Versafine black to stamp the images and then water coloured using Distress inks. Hope you like the card. " I decided to make another card for the challenge as well. This time I used a new background image from Digital Delights that has a built-in beach scene. I added a couple of Wendy's characters to finish it off. I hope you enjoy these last two creations before the challenge closes later this afternoon. I'll be back on Saturday with the winners for this month! the first card is great. beautiful!! the combination of the stamps is so nice to see. and the othercard is zo lovely. the colours are beautiful and so bright.